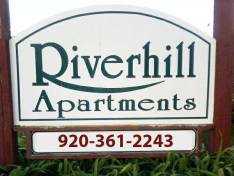 The Riverhill Apartments are located in Omro, WI off of Highway 21. The complex offers a country atmosphere while only being eight minutes from Oshkosh and only a few minutes from the downtown Omro area. Apartment Includes: Two bedrooms, private entrance, abundant closet space, in floor heat, water, A/C, stove, refrigerator, laundry hookup, and a garage. Cats are permitted with extra security deposit.